I love me some Chicken Marsala. 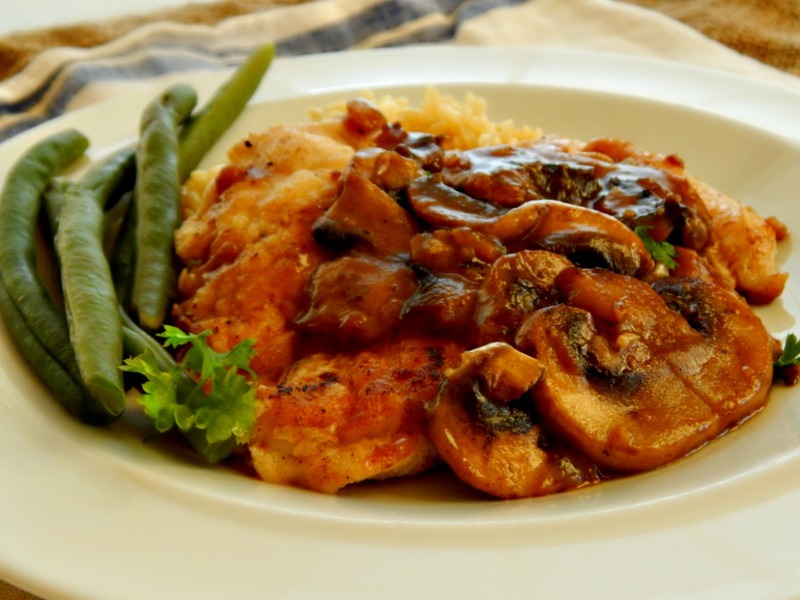 Especially the Classic Chicken Marsala. But Chicken Marsala has a dirty little secret: it sounds (and looks) all fancy but is really nothing more than a sautéed breast of chicken with a simple pan sauce. The hardest part about making this classic dish is pounding the chicken breast into thin cutlets. Other than that, it’s easy, peasy. Fancy enough for company, fast & simple enough for every day. Chicken Marsala practically begs for something to sop up the lovely sauce, so serve with mashed potatoes (or maybe a garlic mash) or rice or a little pasta. And of course, it never hurts to add something bright and green on the side. Any favorite vegetable will do. And perhaps a bit of bread? I love making this easy overnight no-knead bread for dinners like this Chicken Marsala. See below for how I brought this lovely meal for four to the table for under five bucks. Yeah, try to do that at Olive Garden, where their Chicken Marsala runs for $15.99 a plate – so for 4 servings, you’d spend 64 bucks! At home, the Chicken Marsala was under five bucks, the vegetable and pasta or potatoes added about another two or three dollars. Make it at home & keep that 50 to 60 bucks difference in your pocket! But then there’s there ARE those bread sticks to think about, lol! Heat three tablespoons of olive oil in a large skillet to medium-high. Salt and pepper chicken, if desired, then lightly dredge in the flour, shaking off any excess. Place in skillet and saute until just golden brown two to three minutes. Turn and cook on the other side, 2 minutes. You may need to work in batches. Reduce heat to medium, remove chicken from the pan and place in oven, covered, to keep warm. Add two more tablespoons of olive oil to the pan and add mushrooms. Saute, stirring occasionally (about 5 to 6 minutes) until golden brown. (If mushrooms become too dry, add a tablespoon or so of water.) Add garlic and onion and cook for a minute or two longer. Remove pan from heat and add the Marsala, then return the pan to the heat and stir until the sauce comes to a boil, scraping the bottom of the pan. Reduce to a simmer and simmer until the sauce is slightly thickened two to three minutes. Turn off heat and add the tablespoon of butter, slowly stirring it into the sauce. Add the chicken, turning to coat the chicken in the sauce. Place chicken and mushrooms on a platter, pour remaining sauce over the chicken and sprinkle with parsley. If you’d like a thicker sauce, use a tablespoon of flour sprinkled over the mushrooms, cook it for a minute then proceed with the rest of the recipe. Keep in mind as you cook this that the sauce thickens a bit more as it cools. Cutting the Marsala with chicken stock – do this if serving children or others who aren’t too fond of a strong winey taste. The Marsala for this recipe runs about $2.50 for a cup – going 1/2 and 1/2 will knock about $1.25 off the total cost. Chicken: In my area, the low is rarely less than 99 cents a pound for chicken breasts. This is my “buy” price and I stock up. Even if there is a limit, I’ll stop by the store more then once or send the kids in to buy some on a separate purchase from mine. I prefer bone in – the bone has a bit of weight, but it’s worth it’s weight in golden chicken stock. which is easy to make, expensive to buy. See my post on how to be frugal with bone in breasts. Cost for this recipe, two breasts, 12 ounces – 74 cents. Notice, I used two breasts for four people and fill the dinner out with other items than the main protein. The chicken can be pounded out ahead, and even frozen in its thinner state to save time when cooking. Olive Oil: I have a little strategy for buying olive oil – using coupons and sales to lower the price, so click on the link. I think it’s important to use olive oil as opposed to many others – the health benefits outweigh a bit more extra cost, and it can be had at a very reasonable price. Cost for this recipe: 20 cents. Butter: A bit of a splurge, cost and calorie wise – but for taste and health, I’d rather use real butter than trans fat laden margarine or oils. Yes – they do have trans fat, even if the label says they don’t. Harvard, for instance, says unequivocally: “The key to a healthy diet is to substitute good fats for bad fats and to avoid trans fat.” While butter isn’t a healthy fat, many feel that trans fat is at least twice as bad for you as saturated. Buy on deep specials, often around the holidays with store coupons. I shoot for $2.50 a pound and freeze. Cost for this recipe: 1 tablespoons, 10 cents. Flour: Buy at deep special prices, usually around any holiday – coupons are often available from the manufacturers. When you bring flour or products containing flour into your home, freeze for three days to avoid the possibility of any pestilence outbreak. Cost for a half cup is about 10 cents. Mushrooms: They are often on sale at my grocery for about 1/2 price, especially around holidays. I pick them up when they run 89 to 99 cents a package. Turns out, according to the World’s Healthiest Foods, the simple button mushroom as many good qualities as it’s more expensive siblings! Go underdog! Cost 98 cents. Marsala Wine: a “fancy” ingredient, to be sure, sometimes a bit of wine or alcohol totally MAKES the dish. Cutting the wine with a bit of chicken stock will give a milder flavor that kids might appreciate better. Marsala is a fortified wine, and lasts forever – my bottle was $7.99 for 750 ml, or about 25 ounces; since 8 ounces are in a cup, the cost for this recipe is $2.50 if used full strength, $1.25 if cut. Parsley: I’m a big proponent of growing a few herbs – even if you live in an apartment, why not? Put them on a sunny sill, and even if you can’t keep them alive, a plant costs about the same as a packet of herbs at the store. Just dry the herbs and save in small jars. I keep a strawberry pot on my back step so it’s handy, then bring it in to last through the winter. Cost $0.00. I served here, linguini with a few shakes of olive oil, 1/2 pound. My cost is generally always free, but if you don’t use coupons, expect to pay about a dollar a pound. Broccoli was on sale for 99 cents a pound at the store, so I chose it as a budget side – Interesting fact (see my comparison) fresh broccoli is often less than even the cheapest frozen! I used about 3/4 pound and it cost me 75 cents. Chicken Marsala, just like Chicken Piccata, is an easy sautéed chicken breast elevated by a basic pan sauce. Once you’ve mastered the cooking method, it is an easy thing to vary the vegetables and/or flavorings…how about a little white wine with peas? This entry was posted in Click here for Bargain Meals, Click here for Fabulous Food Posts and tagged Bargain Meal of the Week, Chicken, Easy Recipe, Frugal Hausfrau, Heritage Recipe, Italian, mushrooms, Pasta, Wine. Bookmark the permalink.